Seward’s inside game was dominant Saturday night. Redshirt freshman Tamara Seda scored 23 points and grabbed 18 rebounds in her coming out party as the #20 Lady Saints beat Murray State 69-49 in the Green House. Seward’s defense held the Lady Aggies (1-1) to 24 percent shooting and forced 20 turnovers. Rebekah Hatchard hit three consecutive three pointers during a key stretch of the first half and scored 13 points. Kyndal Davis added 12 points and 10 rebounds and Brianna Scott had 12 points, six assists, and six rebounds. The Lady Saints dominated the boards with 67 rebounds to Murray’s 46. Seward had 27 offensive rebounds to Murray’s 12. 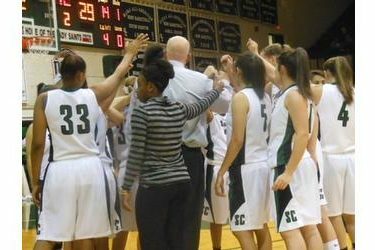 The 2-0 Lady Saints play at perennial NJCAA contender Weatherford, Texas Thursday night at 6.